Stratospheric clouds were observed over England near 23 km altitude on March 3 and 4, 1996, by the satellite-borne Halogen Occultation Experiment (HALOE). These measurements are rather unusual, as much for the low latitude as for the late occurrence of low temperatures. The clouds were examined using gas and aerosol measurements from HALOE (v18), nitric acid measurements from the Microwave Limb Spectrometer (MLS) (v4), radiosonde temperatures, and isentropic back-trajectories [Hervig, 1999]. This is not the first account of stratospheric clouds over the British Isles. Carter and Bridge  analyzed �stratospheric cirrostratus� over Scotland, and their literature review suggests that similar clouds were observed over Scotland as early as 1934. While stratospheric clouds at these latitudes are not unique, they are nevertheless quite rare. A few ground based observers in Britan have reported similar displays, and obtained photographs of the clouds (1, 2, 3). The measured cloud volume density profiles were compared to equilibrium volumes computed for nitric acid trihydrate (NAT) and liquid ternary H2SO4-H2O-HNO3 aerosols. The measurements on March 4 are confidently identified as NAT, and isentropic back-trajectories show that conditions were favorable for ice formation roughly 11 hours upwind of the observed cloud. These results support the suggestion that ice formation could be a necessary precursor to NAT nucleation. A HALOE profile showing NAT detected in the stratosphere above England is shown in Figure 1. 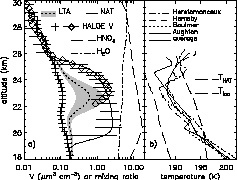 The HALOE volume densities are compared to model predictions of NAT and LTA volume based on coincident radiosonde temperatures, HALOE H2O, and coincident HNO3 from MLS. The observed cloud top altitude (25.5 km) is closest to the NAT calculation, and from cloud top down to about one vertical resolution below (23.5 km) the average measured-calculated volume differences are 19% for NAT and 131% for LTA. Considering the shape and magnitude of the cloud volume profile, the NAT model provides the most convincing reproduction of the HALOE observations. This comparison is robust, and the NAT identification holds for a variety of changes to HNO3, H2O, and temperature. Figure 1. HALOE sunrise measurements on March 4, 1996. The HALOE cloud profile was at 53.8°N, 359.3°E, 6:48 UT, and the HALOE cloud-free profile was at 53.9°N, 335.2°E, 8:24 UT. The coincident MLS HNO3 observation is for March 3, 11:50 UT at 55.1°N, 7.8°E. (a) The measured cloud volume density (diamonds, error bars are ±50%) compared with volumes calculated for LTA and NAT using the average temperature profile in Figure 1b. The indicated range of calculated volumes is for varying the measured HNO3 by ±50%. Also shown are the HALOE H2O (ppmv) and MLS HNO3 (ppbv) profiles used for the volume calculations, and the HALOE cloud free profile (pluses) used to derive background H2SO4. (b) Temperatures from four radiosonde stations on March 4 at 12 UT, the average of these soundings, and TNAT and Tice computed using the H2O and HNO3 in Figure 1a. Carslaw, K. S., B. P. Luo, S. L. Clegg, Th. Peter, P. Brimblecombe, and P. J. Crutzen, Stratospheric aerosol growth and gas phase denitrification from nitric acid and water uptake by liquid particles, Geophys. Res. Lett., 21, 2479-2482, 1994. Carter, R. D., and G. C. Bridge, Stratospheric cirrostratus over Scotland, Weather, 33, 309-318, 1978. Drdla, A., A. Tabazadeh, R. P. Turco, M. Z. Jacobsen, J. E. Dye, C. Twohy, and D. Baumgardner, Analysis of the physical state of one Arctic polar stratospheric cloud based on observations, Geophys. Res. Lett., 21, 2475-2478, 1994. George, D. J., Mother-of-pearl clouds in Antarctica, Weather, 26, 7-12, 1971. Hervig, M. E., Stratospheric clouds over England, Geophys. Res. Letters, 26, 1137-1140, 1999. Hervig, M., and M. McHugh, Tropical nitric acid clouds, Geophys. Res. Letters, in press, 2002.